The King cobra is a species of cobra known by the scientific name Ophiophagus hannah. It is the longest venomous snake in the world, but rather is a slender, weighing only up to about forty-five pounds. The bite of the king cobra kills several people every year. Its venom has the potency to kill a fully grown elephant. The king cobra also has enough venom to kill twenty adult humans. It is a very dangerous animal. The mortality rate for people bitten by king cobras, and are untreated, is seventy-five percent. The behavior of a king cobra is actually not very hostile. It will usually try to avoid conflict, but if threatened, they will rear up and flare their hood while producing a hissing sound, which resembles the growl of a dog. They are mostly active during the daytime hours, and will rarely ever be seen at night. This snake can slither on land, climb up trees using its strong muscles, and swim on water. Many king cobras can live up to twenty years if enough food and habitat is available. Some king cobras in captivity have lived to be almost thirty years old. King Cobras have been found to grow up to twenty feet in length. The average length of this species of snake is about thirteen feet. This snake has the ability to hold one-third of its body above the ground, and is a very intimidating sight for many. The fangs of king cobras are short and stubby. They are hollow, and can be up to one-half inches long. When the cobra strikes, the poison is forced up through the fangs. The venom, composed of a mix of polypeptides and proteins, is produced in special glands behind the animals eyes. Though the venom isn't as toxic as that of many other species of snakes, there is a lot of it. The breeding time for king cobras is usually from January to April. The male will act strangely (almost like it's drunk) during this time. He will follow any snake no matter what the species or gender, then he will smell the scents coming from it to determine what it is. If it's a male, he will quickly leave, in search of another snake, hopefully, this time, a receptive female. Once the male finds his female, they will mate. From April to June, the female will lay her eggs in a nest that she makes. The male will usually stay in the area. The female king cobra will lay anywhere from forty to fifty eggs, and will incubate them for about seventy days. When the baby snakes hatch, they are black with bright yellow or white marks along their head and body. The diet of a king cobra majorly consists of other snakes. That is literally what its scientific name means. The King Cobra is a carnivore that sometimes will eat lizards, frogs, or small mammals if there is a food shortage in the area. The main enemies of the king cobra are humans who destroy their habitat, mongoose, who have some resistance to cobra venom, and some birds of prey. When the snake sees any of these potential threats, it usually flees. These snakes can be found in Southeast Asian rainforests. They usually stay near swamps, lakes or ponds. 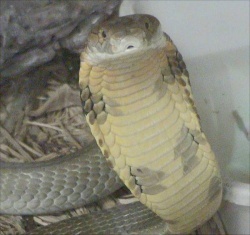 King cobra at the Cape Fear Serpentarium in Wilmington, NC. A King cobra inside a glass box. Snake charmers occupy an almost religious significance in Pakistan. They interact with King Cobras and other various poisonous snakes simultaneously and attract crowds no matter where they are. This page was last modified on 3 March 2014, at 19:16.